Description: Gorgeous updated home on best cul-de-sac lot in area! Updated kitchen with new dishwasher, under cabinet lighting, new floors & pantry. Lg master suite w/vaulted ceiling, fresh paint & lg closet. Remodeled jack & jill bath. 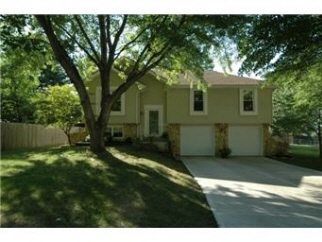 Fin bsmt w/rec rm, fireplace, wet bar & 1/2 bath. Huge treed cul-de-sac lot. Vinyl siding. Great deck & patio & new windows. Directions: I-435 & Shawnee Mission Pkwy - E on Shawnee Mission Pkwy to Pflumm. N on Pflumm to 63rd ST. W on 63rd to Hallet. N on Hallet to 62nd TR. W to Albervan. S on Albervan to cul-de-sac.